Amid more than a half a century of antagonistic political relations between the United States and Cuba during which commercial ties were largely severed, U.S. exports of agricultural products to the island nation currently stand out as one of the few points of engagement between the two countries, if to a limited degree. U.S. exports of medicine and medical products is the other product category for which the U.S. government has eased its long-standing embargo on trade with Cuba. In a major diplomatic initiative, President Obama announced in December 2014 a significant shift in relations with Cuba with the goal of transitioning from a decades-long policy of sanctions that were designed to isolate Cuba toward a more normal bilateral relationship. This book reviews the current state of agricultural trade between the United States and Cuba, identifies key impediments to expanding bilateral trade in agricultural products, identifies key provisions in the law to which these obstacles are anchored, and considers the potential consequences for trade in agricultural goods in the event that the current thaw in diplomatic relations was to be extended more broadly so that bilateral trade was returned to a more normal footing. It also summarizes several of the bills introduced in the 114th Congress that propose to remove specific restrictions that impede trade in agricultural goods or that seek to lift the embargo on Cuba entirely. 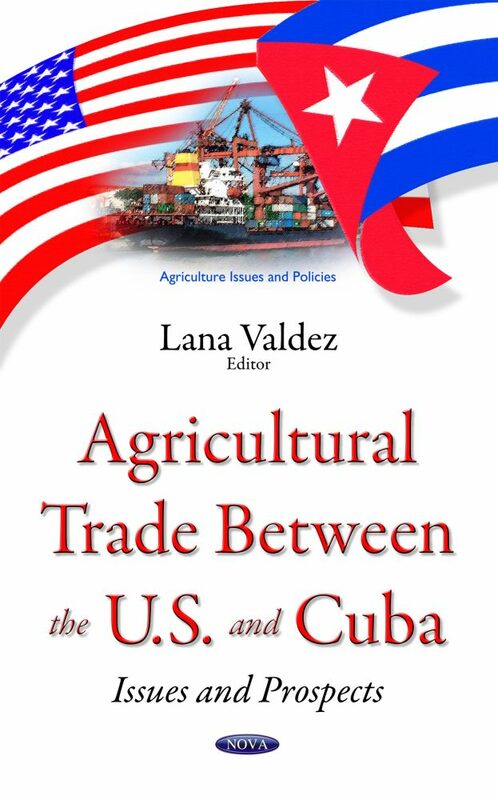 This book also discusses the past, present, and possible future of the U.S.- Cuba agricultural trade; and provides information on Cuba’s regulatory environment as it relates to U.S. agricultural exports.